The centre was established in 1997 with the aim of educating the public in order to promote an awareness of the raptor species and their plight as a growing endangered species. The Centre is extensively involved in promoting the well being of this incredible species. Public support to maintain their efforts is something they rely on heavily. Any form of assistance is highly appreciated. 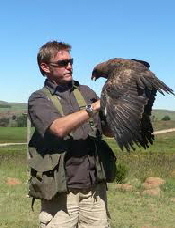 Proudly Dullstroom wishes to promote the Dullstroom Bird of Prey and Rehabilitation Centre by establishing this web page and thereby creating the desired awareness in an effort to lure visitors to the Centre to meet meet their raptors. In their continuous drive to raise funds for the centre, a "sponsorship" programme was implemented. Businesses, individuals or families are invited to sponsor a particular aviary or bird for one year. This goes a long way towards covering the costs of caring for that aviary or bird during the year and in assuring the continued existence of the Centre. Come and get a close-up view of how raptors fly and attack their prey. You will be amazed at how agile and graceful these birds are in flight and attack. Weather permitting, flights are performed twice daily at 10:30 and again at 14:30. Each display is different and we fly up to ten species per day. Our shows are entertaining and informative.